A civil protest group from Tambon Ban Mae Hor Phra gathered at Chiang Mai City Hall on June 10 demanding the Chiang Mai Provincial Industrial Office revoke the closure of their local quarry. Chiang Mai Governor Suwat Tantipat receives from the protest group a letter asking that the quarry be re-opened. The protesters’ representative, Satien Duangchuen told Chiangmai Mail that previously a group of villagers, led by the village headman Mongkol Jitta, disagreed with the operations of the quarry. Satien quoted Mongkol as saying that the quarry caused damage to natural resources, the environment and tourism areas. Following that, the Provincial Industrial Office announced the quarry would be shut down. However, Satien claimed that the majority were in favor of the quarrying operation. 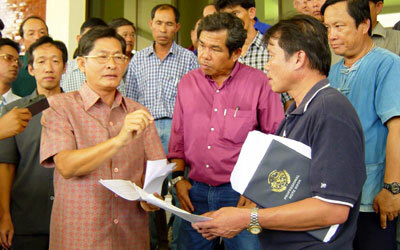 Their letter of demand was then handed over to Chiang Mai governor, Suwat Tantipat. Protestors appear satisfied after the governor accepted their letter and promised to look into the matter. Supol Sripuak, a villager, said that many people support the quarrying because they think it would increase villagers’ incomes and create job opportunities for them. He admitted, however, that there are also a small number of people opposed to the proposition. A 40 seat air-conditioned coach, chartered by the Faculty of Medicine, overturned in Hod District, Chiang Mai valley, when the bus driver lost control of his vehicle, killing Arsa Wangta, a 20 year old third year medical student. The medical students were returning from a rural development camp in Mae Lai Duang Jan hill tribe village, Hod District, Chiang Mai. Three girls were seriously injured in the accident, Phongsai Taksa-udom, Tawan Burapadej and Sakunee Khankam. Another 23 students received minor injuries and all were sent to Maharaj Nakhon Chiang Mai Hospital. The accident occurred in the evening of June 15, and Hod District inspector Pol. Maj. Chaiduangthip Chaichua and his team began an immediate investigation at the scene of accident. Initial findings appear to show that a steering arm failed on the vehicle. The Rural Development Relationship Camp is organized each year by the Faculty of Medicine, Chiang Mai University for the first and third year medical students. The camp is designed to allow the young medical students to experience life in an agricultural setting. The concept is to give them a chance to understand and gain empathy for the rural peoples. If they were ‘smarter’ they wouldn’t be there! With the Chiang Rai jail full to overflowing, there is now insufficient jail staff, so the Chiang Rai Provincial Central Prison has opened five mini-marts in different sections to sell necessities to the prisoners. Rather than using cash transactions, a ‘smart card’ will be used. In this system, everyone has his or her own account in a smart card, which will then be used to buy products. The smart card will show the total amount of money left in the prisoner’s account and the total will be debited after purchases are made. It has been deemed safer for the prisoner and it saves costs and manpower. “The project was started three months ago and the prisoners’ relatives are very satisfied because after transferring money into the account, they receive a pay-in slip which the prisoners can also check, so they always know how much money they have to use,” said the Chiang Rai Central Prison Commissioner, Sirisawat. The prison was only built to accept 3,000 people, but it now has 5,100 inmates. Chiang Saen Harbor construction in Chiang Rai Province is almost completed and the port facility is expected to be opened at the end of June. 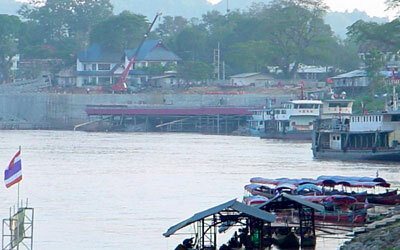 Chiang Saen Harbor construction is expected to be finished by the end of June. Saman Chimwiset, the Mekong River Port construction control engineer, covering Chiang Saen and Chiang Khong districts, said that with the 90 million baht budget, the Chiang Saen Port is now 96% finished and will be completed two months ahead of schedule. The harbor will serve the Mekong River under the development plan of the Quadrangle Economic Cooperation among the four countries located along this international river, Thailand, Laos, Myanmar and China. There will be 14 ports along the Mekong River, two of them in Chiang Sean and Chiang Khong districts in Thailand. Chiang Saen Port is a modern facility located on the bank of Mekong River and covering a 10-rai area. There are buildings to house offices for Customs, Immigration, Merchant Navy, and a salvage vessel for the river waters. There are two 50-meter piers and floating landings with a carrying capacity of more than 8 merchant ships. The International Network for Economic, Social and Cultural Rights (ESCR-Net) held their inaugural conference in Chiang Mai from June 8-10. Entitled, “Creating New Paths towards Social Justice”, it brought some 200 participants together at Lotus Pang Suan Kaew Hotel. 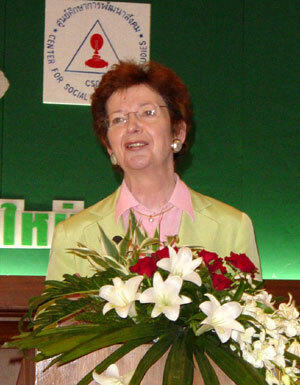 Former United Nations High Commissioner for Human Rights, Mary Robinson, and now executive director of Ethical Globalization Initiative, delivered the keynote address at the International Network for Economic, Social and Cultural Rights (ESCR-Net) inaugural conference in Chiang Mai. ESCR-Net is a new collaborative initiative from groups around the world working to secure economic and social justice by promoting the recognition of all human rights with a specific focus on economic, social and cultural rights (ESCR). Through ESCR-Net, groups and individuals can exchange information, develop a collective voice, amplify their actions, demonstrate the substantial advantage of an ESCR approach in working to eliminate poverty, and promote and advocate fair economic, social and cultural laws, policies and practices at all levels. The former UN High Commissioner for Human Rights, Mary Robinson, and now executive director of Ethical Globalization Initiative, delivered the keynote address reviewing the progress in realizing the fundamental rights of people in every part of the world. The participants came from local grass-roots organizations to international NGOs in Asia, Africa and Latin America. The ESCR-NET conference included plenary sessions, workshops, interactive sessions, governance meeting, and informal caucuses. The Cabinet has approved in principal a budget to promote and develop the district areas of Chiang Saen and Mae Sai in Chiang Rai Province as special border economic zones. According to Mrs. Sirinart Sennant at Chiang Rai provincial commercial office, the cabinet agreed to allocate a budget of 730 million baht for the first phase, to be spent in the next fiscal year. This upcoming budget will be spent on development work for the economic zone’s basic infrastructure, utilities, and other facilities. One important item will be the improvement of the roads linking Mae Sai and Burma and Chiang Saen to Laos. 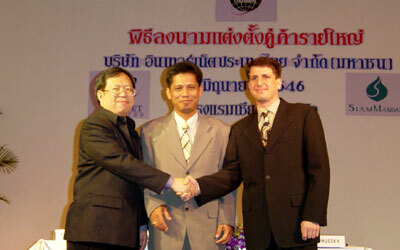 Work is also being prepared for the development of the Chiang Saen district town and urban planning systems. Construction or improvement of the existing water and sewage systems will be carried out in Chiang Saen, including the improvement of town bypasses. More significance will be given to the preservation and beautification project of its historical ruins. In Mae Sai, the urban planning projects as well as road improvements, similar to those in Chiang Saen will be undertaken as soon as possible to cope with the trade and tourism industry with Burma. The Department of National Parks, Wildlife and Plants has warned that possession of endangered wildlife species can contravene the new laws. Wichien Noonrowd, the head of Chiang Mai Public Relations Office said that people who are keeping endangered wildlife must notify the officials within 120 days of the types and numbers of the animals referred to in the Wildlife Sanctuary Act. According to the Act, effective since May 13 this year, persons keeping endangered species without permission may be imprisoned for not more than 4 years and/or fined 40,000 baht, added Wichien. More information may be received by contacting the Office of Forest Preservation Management. Soon they’ll be giving them away! The Computer Club of Chiang Mai (CCC) is promoting another low price computer project for northern users. The club has organized an SME PC computer project, along with Computer Business Clubs of the Northeast, and Phuket Computer Club, to help provide knowledge on Information Technology (IT) to beginners. Their low priced entry-level computer is called the Arkanee which is only 13,900 baht (excluding VAT), said Rassami Wes-urai, club chairwoman. She said that this CCC project could help solve the economic recession, as well as help boost the cash flow or liquidity of IT related businesses. She said that about 1,000,000 computers would be available in the marketplace, in addition to other low price computers, to help relieve the plight of small computer business. Signed MOU with Internet Service Co and Siam Mondalay Co.
Inet has signed a Memorandum of Understanding with Internet Service Co and Siam Mondalay Co to run services for Internet users. Internet Thailand Co (Inet) is a joint venture of the Communication Authority of Thailand (CAT), the Telephone Organization of Thailand (TOT), and the National Office of Scientific and Technological Development. (From left) Rawat Wangpredaledkul, MD of Internet Service Co, Chamroen Kornkaset, the assistant managing director in Business Function of Inet, and Steven Prussky, the MD Of Siam Mondalay Co. signed a memorandum of understanding at the Chiang Mai Orchid Hotel. For more information on services and scope visit www.inet.co.th and www. thai.com or contact the Inet call center 02 257 7111, 053 210 831. The New Entrepreneurs Development (NED) project is to be held on Jun 28 at Chiang Mai University (CMU) Convention Center. The Institute for Development of SMEs, CMU Network has set up the NED program, called “How to Start a Successful Business”, with invaluable advice from experienced business owners and consultations with finance providers for low-interest loans. “Our target groups are new entrepreneurs, the unemployed, final year university students and any people interested in self advancement through business. It is expected this project would be useful for any SME’s looking at expansion as well,” said the director of Institute for Development of SMEs. The project was previously held in Chiang Rai and deemed a success with around two thousand people attending the seminar. For seat reservations and more details, ring CMU network office, tel. 053 942 852-5. The People’s Convention and People’s Forum on the rather wordy title of Economics, Social, and Cultural Rights Towards Social Justice was held by Thai NGO’s at Chiang Mai Phucome Hotel. Pairote Polpetr, from the Union for Civil Liberty, said that this meeting aimed to give an explanation on civil and political rights, as well as economic, social, and cultural rights to the NGO’s, and attempt to address how to apply this framework in problematical situations. 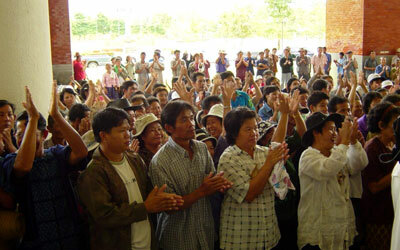 More than 170 participants were at this meeting with many being grass roots folk who feel they have suffered from the governments’ development projects such as the gas pipeline construction in Prachuap Khiri Khan, people from Pak-Moon dam in Ubon Ratchathani, and highland people who were chased from their own lands according to the government’s policy on community forests. There was also international representation from India, who are faced with the problem of construction of a dam across the Namada River, a representative from Brazil with questions about land ownership, and a representative from the Labor Union. Prof. Banton Ondam, Assembly of the Poor coordinating committee president, said that the government should concern itself more with the basic needs of people at all levels, consider all stakeholders, and importantly they should look at people as human beings, not as a commodity. “Even if we are poor, we are the citizens of the country and we have our rights according to the constitution of the Kingdom,” said Prof. Banton. The judges truly had their work cut out for them, for 80 of the north’s most beautiful young women entered the first round of the 2003 Priew Super Model Contest held at Central Airport Plaza in Chiang Mai on June 14. The 5 finalists: Jojo, Poy, Anne, May and Pou Pee. When the day was done, five young women’s dreams remained in tact, and all five will go on to represent the north in the finals, scheduled for June 25 at Central Sofitel Hotel in Bangkok. Chao Korkaew Prakaikawin na Chiang Mai, a well known northern dignitary, was invited to chair the judging committee, a tough task indeed. The committee first had to whittle down the field from 80 to 24 contestants. They then selected the five “most beautiful” to vie for the national title. The lucky five were Noppawan “Jojo” Noppakunkajorn, Ruksakul “Poy” Boonkum, Chada “Anne” Srichuchart, Hathaichanok “May” Sutpa and Titaree “Pou Pee” Takengkaew. Panitnart Yeampeka, the general manager and fashion editor of Priew Magazine, said that this was the 7th year they’ve run the “Priew Super Model Contest”, but it was the first time they included other provinces as well as Bangkok. The sponsors of this year’s super model contest are Citra, Blue Corner, L’Oreal Paris, GSM 1800, National, and Mistine. The Priew Super Model Contest is seen as a first step for young women who are interested in becoming models or actresses. The rainy season generally begins in June. The Meteorological Center predicts that the low-pressure trough will lie across northern and northeastern Thailand, accompanying the southwest monsoon over Thailand and the Gulf of the Thailand, resulting in scattered to widespread thundershowers with isolated heavy falls. Later in the month, the low-pressure trough will drift northward to lower China, causing a weakening southwest monsoon over Thailand and the Gulf of Thailand. During this month, the tropical storms in the Western North Pacific may occur and pass through the Philippines toward the South China Sea, and this southwest monsoon may result in increasing rainfall amount over Thailand. The Northern Meteorological Center forecasts that there will be scattered to almost widespread rain showers, and isolated heavy falls. Maximum expected temperature is 32-34 Celsius with minimum temperatures 23-25 C., relative humidity 75-85 %, rainfall 150-200 mm and 16-20 rainy days. Southerly winds will hit with a speed of around 10-20 kph. The official forecaster, Mrs. Sansanee Chaichiangpin, suggested that people should avoid lightning by coming indoors and not using electrical appliances during the thunderstorms. The Department of National Parks, Wildlife and Plants has appointed a special control unit to look after the 50 year old teakwood forest gardens in Denchai District, Phrae ProvinceZ. Kraipetch Parnsomboon, the director of the 13th Forest Conservation Management Office, Department of National Parks, Wildlife, and Plants, Ministry of Agriculture and Cooperatives presided over the launch of a special control unit to investigate the areas of the four forest regions of more than 10,000 rai, covering Huay Rai, Mae Puak-Denchai, Mae Jua-Mae Man, and Mae Jua teak-wood forests. The 50 officers work in cooperation with the village headmen from 9 villages. Kraipetch said that these are first generation teakwood forests, more than 50 years old, and are an important source of new teak, but the problem is that the forests are located near the main road, and the felled trees could be easily transported away. However, the forest protection project would affect local business. Local people could not cut the bamboo in the forest to make into chopsticks, and toothpicks for example, which was their main income. Currently, the government has allowed people to cut bamboo, and collect bamboo shoots for their own consumption but not in commercial quantities. The people would have to ask the governor to hold a public discussion on the problem, and set the guidelines for using the forest areas. Regional Irrigation Office 1 will set up a special center to help with flood prevention and solutions to problems in each flooded area. The Center will also follow-up and gather information about the rainfall volume and then report the situation to all concerned. The office director, Soonthon Cheanjaren said that the office is prepared and will be the response center for Chiang Mai, Lamphun and Mae Hong Son. 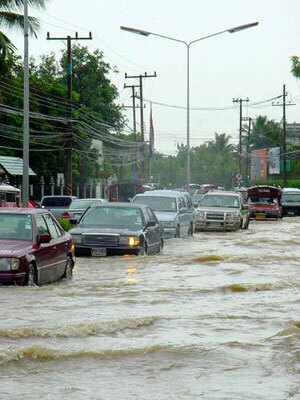 The center will receive information from the Chiang Mai Hydrometeorology Center, and follow all weather forecasts closely from Northern Regional Meteorological Center such as rainstorms and rainfall volumes. Each district’s flood assistance project will be responsible for helping flood victims by providing aid assistance, equipment, food supply and liaison. Information about the floods can be had by phoning 053-248925. Lamphun Governor Tawach Sathiennam stated that influential mafia-style agents must weeded out from this tiny northern province, adding that he has never been afraid of any influences in the area. Governor Tawach spoke to village headmen and drug suppression volunteers in the area, telling them that suppression in Lamphun could reach the targeted goal of 100% as expected, with all the dealers involved in drug trafficking in the province arrested. Recent success has resulted from cooperation between the area’s local leaders and volunteers. However, drug suppression will continue until there are no drug addicts left in any village. Regarding the government’s dark influences policy, Tawach said that Lamphun will respond to the policy and will not be afraid of any influential figures in the provinces. The governor has asked the local leaders to inform the district chiefs to collect a list of names to send to the provincial special committees for further consideration. The governor has also demanded the provincial officers get rid of motorbike gangs who have been involved in attacks on the public. “These kinds of criminals always frustrate the city’s security and I want the motorbike dealers and local people who know the gangs to inform the government officers,” said Tawach. The Burmese Women’s Union (BWU) in cooperation with Migrant Action Program Foundation (MAP), and Women’s Studies Center, Chiang Mai University held a special seminar to register their protests against the current Burmese military’s actions regarding Aung San Suu Kyi. The rally was held at thee Women’s Studies Center. Aung San Suu Kyi, the 1991 Nobel Peace Prize winner and leader of the Burmese National League for Democracy (NLD), was at the center of a disturbance at the end of last month, after which much rumor has been in the world media. Khin Ohmar, the coordinator of the National Reconciliation Program and Burmese Women’s Union said that the military regime tried to take action against the democracy movement in Burma, and this was the time for people all over the world to fight against the dictatorship. “Many of us have been in Thailand as refugees; we stay in refugee camps, and there seems to be nothing we can do, so we hold a meeting not just for exchange of information, but we also look for any support from neighboring countries and other international communities that might help us,” said Khin Ohmar. The Burmese Women’s Union (BWU) and the networks held a candlelight vigil for Aung San Suu Kyi’s 58th birthday at Thapae Gate on June 19 calling for Aung San Suu Kyi’s freedom and political freedom in Burma. The Thai government has declared that children’s rights, juvenile crime, violence against women and human trafficking are part of the national agenda. This includes issues of physical abuse, sexual harassment, prostitution and oppression. Police officers from eight provinces under the Provincial Police Region 5 participated in the meeting. 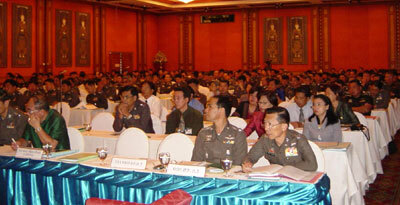 To address this, the National Thai Police Office held a conference at the Empress Hotel for the police under the supervision of Provincial Police Region 5, to promote understanding about juvenile care, protection of women and prevention of human trafficking. The conference guest speakers, including the advisor to the prime minister, Laddawan Wongsriwong; the secretary of the US ambassador, Timothy M. Scherer; high-ranking officials from the Social Development and Human Securities Ministry; government and non-government organizations promoted understanding among operational officers. The largest haul of ya ba pills since the War on Drugs campaign was launched, was seized on June 10. Pol Lt Gen Prung Boonphadung, the commissioner, said 217,200 pills were seized from Wiang Haeng District, and two drug smugglers were apprehended, a 25 year old Burmese man and a 12 year old village boy. Working on a tip-off, undercover police officers from Wieng Haeng Police Station, led by Pol Lt Arunsak Buaprasertying, tricked the drug dealers by pretending to buy the ya ba pills. The haul was actually buried about 2 meters underground. “Due to the war on drugs, drug traffickers and dealers are no longer able to smuggle drugs out into the marketplace. So (in this case) the speed pills were buried until they thought it was safe to bring them up,” said Pol Lt Gen Prung. Police believe that there could be more caches of pills hidden along the boundary area and are planning to get more evidence and seize them. Pol Maj. Gen Wut Withitanon, the commander of Chiang Rai Provincial Police has stated that Chiang Rai police have cracked down on drugs since October 2001, long before the government’s much publicized “war on drugs” this year. He is so sure of the local force’s commitment that he now says that Chiang Rai will be totally drug free by October. The recent figures, up until March this year, show that 1,211 drug dealers have been caught, 51 drug networks destroyed, 8,000 drug users rehabilitated and 578 million baht in property has been confiscated. The main target is 178,000 highland people in 332 villages. Pol Maj. Gen Wut added that 2,800 officers have been assigned to work in the operational field in their own area. Since Chiang Rai has a reputation as being a drug market, police will block and stop drug smuggling to other provinces by placing permanent checkpoints in many areas. As well as suppression, rehabilitation has been launched. Drug users can step forward and have treatment. It is expected that this operation will make the drug problems in Chiang Rai Province disappear totally. The commander of the 33rd Border Patrol Police Headquarters, Pol. Col. Kusak Arsasupakit announced the results of their three month period of drug suppression. Interceptions of trafficking routes were carried out over 500 times and between those and the checkpoints, the police feel that they have accomplished much to assist the government policy. Checkpoints in the areas of Chaiprakarn and Chiang Dao districts resulted in 7 suspects arrested, and the officers seized 3,617 amphetamine pills, 3 pistols and other tools. During drug investigations, authorities arrested 32 suspects with more than 10,000 amphetamines pills, 6 pistols, and cash of about 13,700 baht. In terms of the treatment and rehabilitation for drugs addicts, the police gave full support to the Drugs Combating Center in Fang, Mae Ai, Chiang Dao, Wiang Haeng, and Chaiprakarn districts, Chiang Mai. Currently, 2,180 patients are participating.